In recent years, advertising strategy has gone though great changes. In the past, advertising on the television station and local community newspapers of a foreign country was enough, but these days, these sources are losing their attraction and visitors, as the Internet takes over. Now is the time for advertisers to allocate their ad revenues to include web advertising in their yearly budget. Alexa.com is an online measure of all websites based on the historical traffic of the last 3 months by Amazon (Alexa.com). It considers the average page views for each visit and how many unique visitors have entered a website. Though not a 100% perfect tool, it is a benchmark for tracking your Internet marketing accomplishment. It is updated daily and the scale starts at 1 – The highest and most trafficked website. For instance, as at 3rd of May of April 2011, Google.com has an Alexa web traffic rank of 1, Yahoo.com closely followed Google with a rank of 2 and Facebook.com with an Alexa ranking of 3. It means that the lower your Alexa rating or ranking, the more popular your website. Understand clearly that the higher your ranking the worst, in terms of visitors, is the site. There are some 255 million websites as of December 2010. and that number is growing geometrically. Alexa.com ranks only those sites above approximate 28 million. So, if a site ranks, 24,000,000 it means that there are 24,000,000 web sites ahead of it, and it is considered a negligible web site, as very few visitors have stopped there. The closer you reach to 100,000 the better your site is. When it reaches 100,000 and below, it is among the best in the world with significant visitors to make any advertiser happy. Why should I care about Alexa Ranking? 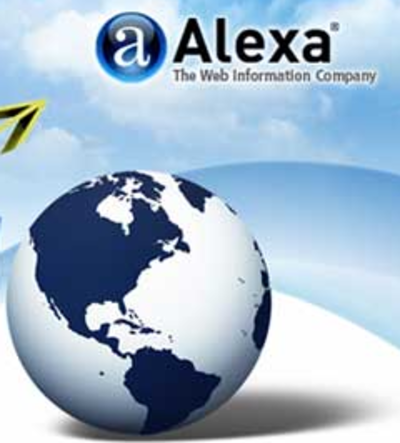 Having a good Alexa.com rank is one of the most critical indicator of the viability of your website or blog. The rule of thumb is: the higher ranked on Alexa.com, the more business you receive. Advertisers are willing to pay much more to advertise on websites or blogs on Alexa’s top 100,000 sites. Thus, lower the ranking, the higher the ad earnings. An Alexa.com ranking also has a major impact on Google search engine results; the lower the Alexa ranking, the higher your site would appear on Google search results. 1. Alexa starts showing ranking graph when you get into the top 100k sites..
2. In the top 100k only 100k sites are there. So it’s quite an achievement. 3. Alexa sells top 25k, 100k etc. site lists. These lists are a free download. Many companies use these lists; generate business opportunities and buys advertising. If your site is listed, then it may create additional revenue streams for you. 4. If you have a site with less than 100k Alexa rank then advertisers will buy more space on your website. 5. Lack of other easy methods for calculating a website’s traffic by external means is also a reason why Alexa rank is used. How Do I improve Alexa Ranking? 1) Update your site constantly, at least 3-4 articles per week. 3) Encourage your website visitors to add a good testimonials on Alexa’s detailed listings page for your website. 6) Exchange links with other relevant sites which had good Alexa ranking. 7) Get listed on as many search engines as possible by placing a listing in DMOZ. It often takes up to 5 months before you are listed after submission. Even though it takes long, it’s worth the wait because it’s so widely accessed across the Internet. 8) Do not use bots or any other automated methods because you may actually wind up losing rankings easily if Alexa finds out! Taking these easy steps will make a huge difference in your Alexa ranking. Eventually you will be concerned not only to get visitors, but also to keep them in your site and convert them to customers. Optimize your home page for SEO purposes. Make it easy of use, and interact. Create a positive user experience. That’s how you will get visitors to return over and over.